Arlington Heights police responded about 10:27 p.m. Monday to an animal complaint in the 2100 block of Eastman Court. A male/subject came to the door of a resident in the cul de sac and told the resident that a coyote attacked his dog. The male/subject and the dog left, and the coyote was no longer in the area. The resident asked the police to check the area. No confirmation of the animal attack is known, and no report of police assisting a resident with getting a dog to a veterinarian is known. Coyotes are known to pass through the area of Memory Gardens, just to the east of the report of the dog attack. On November 20, 2010, The Cardinal photographed a coyote in Memory Gardens at a location about 2300 feet east of the coyote dog attack reported last night. Coyote sighted at Memory Gardens Cemetery on East Euclid Avenue in Arlington Heights on Saturday, November 20, 2010 with map showing distance from reported coyote attack on April 2, 2012 in Eastman Court. 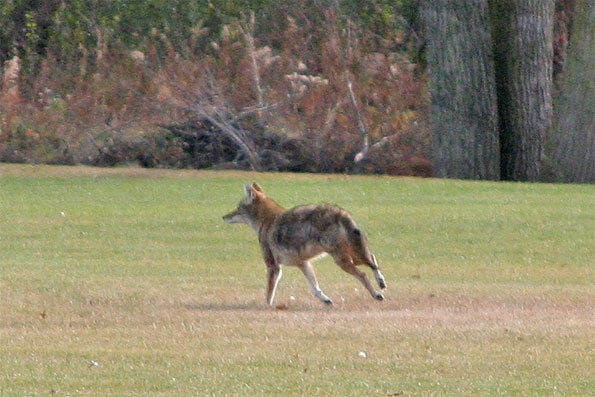 Map: Coyote photographed 2300 feet about 1 1/2 years ago. How does a fox look compared to a coyote? Fox video walking through Arlington Heights. Coyotes are larger animals with longer legs and a bigger rib cage area. Foxes have larger heads, larger ears and bushier tails. Foxes are not as aggressive as coyotes.